An Airbus A320 on a training flight at Prestwick Airport, UK, suffered a hard nose gear touchdown during a rejected takeoff. The damage was discovered after the subsequent takeoff. Fourteen flight crew, comprising two training captains, 11 trainees and a safety pilot, departed Birmingham Airport for a flight crew base training detail at Prestwick Airport. Training circuits were carried out using runway 13. While taking off after a touch-and-go landing, a takeoff configuration warning was generated. This warning resulted from the speed brake lever being inadvertently placed in the speed brake range, during the touch-and-go landing, in such a position that it did not command spoiler surface deflection. The timing of this selection indicated that it occurred when the ground spoilers were being disarmed by the commander pressing the lever downwards. This then caused the takeoff config warning to be activated after takeoff power was set, and the commander rejected the takeoff. The aircraft was brought to a halt on the remainder of the runway. The nose landing gear sustained some damage as the aircraft de-rotated on to the nosewheel during the manoeuvre. The crew did not consider the touchdown on the nose landing gear to be excessive and were not aware of the damage. After a short delay, the training detail was continued. On the subsequent takeoff, with the co-pilot as pilot flying, an ECAM message, “l/g shock absorber fault” was generated. This meant that the landing gear could not be retracted and that the autopilot and autothrust were unusable. During the climbout the aircraft started to descend so the commander took control and resumed the climb to circuit altitude. After considering the status of the aircraft, the commander cancelled the training detail and the aircraft was diverted to a maintenance base. Investigation by the AAIB revealed that the derotation rate during the rejected takeoff, which resulted in damage to the nose landing gear, was calculated as -9.8°/s. 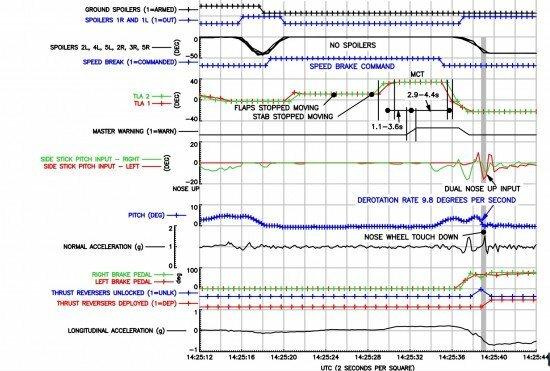 Over a 12 month period, on its A320 fleet, the operator did not detect any derotation rates during landings of -5°/s or greater. It also appeared that the loss of altitude during the climbout occurred when CLB thrust mode was engaged. The selected target speed at that moment was 130 kt, which was below the aircraft’s current speed of 180 kt. The selected speed of 130 kt may have corresponded to the approach speed from the previous approach.